Computers can be both excellent tools and sources of overwhelming frustration. Common recurring problems are frustrating and can take time to deal with if you don’t know the best way to fix the problem. Here are three common computer problems you may have run into and easy ways to fix them. You might be familiar with the symptoms of this common computer problem: sluggish performance, programs take longer to open and close, and then a little message box pops up to inform you that “your system is running low on virtual memory”. What this means is that your computer is running out of Random Access Memory, or RAM, and is having trouble running programs as effectively due to memory constraints. Despite the serious-sounding nature of the message, there are two easy ways to fix this problem. The first thing you can do is increase the virtual memory on your computer. Click on System, or click on System and Security and then click on System. On the left, click on Advanced System Settings. If necessary, enter your administrator password or provide confirmation. On the Advanced tab under Performance, click the Settings button. On the Advanced tab under Virtual memory, click the Change… button. Clear the check box labeled Automatically manage paging file size for all drives. In the box under Drive [Volume Label], select the drive with the paging file size you want to change. Click Custom size, and input new values for the Initial size (MB) or Maximum size (MB). Click Set, then click OK. It should be noted that increases to the paging size will not require a restart of your computer, but decreasing the paging size will. If you’ve made changes to your virtual memory by following those steps but still are getting error messages, you may need to purchase and install more RAM. Generally, the more RAM your computer has the better it performs. You’ll need to check and see how much RAM you have before you purchase any additional RAM. Under System next to Installed Memory (RAM), you can see how much RAM you have in your computer. Windows 7 needs at least 1 GB of RAM, Windows Vista needs 512 MB, and Windows XP needs 256 MB to run properly. 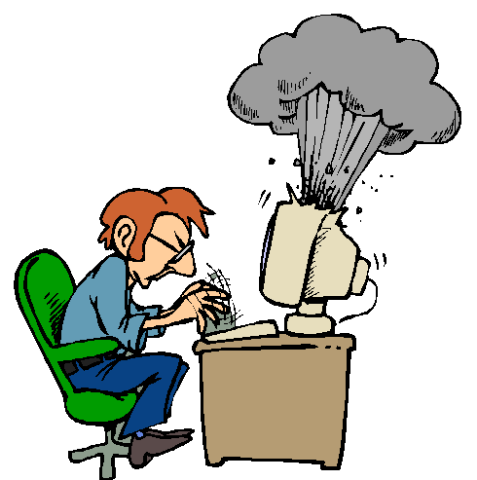 If your at work is slowing you down, be sure to contact an IT administrator to assist with adding new RAM. If it’s your personal PC that needs RAM, you can buy it online or purchase RAM from a store and possibly have the people that work at the store install it for you. By now you’re probably comfortable with clicking and dragging on the top of windows to drag them around the screen and place them where you want. Sometimes you can drag the windows far enough that the top of the window is out of reach and you can’t move your window back to where you can see it or interact with it. Fear not, because there is a way to bring it back with your keyboard. Select the program you want to move, then press ALT + SPACEBAR on your keyboard. This should display the program’s shortcut menu. Use your arrow keys to move the window so you can see the title bar on your screen. When you have moved the window to where you want it, press Enter. The taskbar at the bottom of the screen shows you what programs you have open and gives you access to your Start Menu, so when it disappears it can be a serious problem. Without the taskbar, it’s difficult to start programs, change settings, or even turn off your computer. The good news is that the taskbar never really goes away, it just has several ways that it can hide. Right-click the taskbar and click on Properties. Fill the check box labeled Lock the taskbar. Clear the check box labeled Auto-hide the taskbar. This will ensure that your taskbar stays in the same place, is visible with any windows open, and won’t disappear if you move your mouse away from it. If you’ve minimized all windows but still don’t see the taskbar at the bottom of the screen, check the sides and top of the screen. It’s possible that you may have moved it on accident, and it’s easy to move back to its original position. Click-and-drag your taskbar to the bottom of your screen. Right-click the taskbar, then click on Properties. It’s possible to shrink the taskbar to the point that it’s barely a line at the edge of the screen. If you can’t find the taskbar on any edge of the screen after minimizing all windows, look for a thin strip on the edge of the screen. Point your mouse at the edge. It should change to a double-sided arrow. Click-and-drag the mouse towards the middle of the screen to widen the taskbar. If the taskbar is not on the correct edge of the screen, click-and-drag the taskbar towards the edge you prefer and take the steps to Lock the taskbar listed above. These three solutions to some of the more common computer problems can save you time and frustration in the long run. If you run into other problems, be sure to check back for more tips and fixes for computer problems.